“The Sudan Doctors’ Union – UK branch was established in 1976. We work on the welfare of our members in the UK, who are largely clinicians and trainees working in the NHS. The SDU itself was established in Sudan in 1948. However, in 1989, the military dictatorship which came in power abolished the trade unions and started their own associations. To a president you had to be loyal to the regime, rather than acting in the interests of your members, the community or society. It is not new for SDU UK branch to support democratic change in the Sudan, this has been part of our tradition since the 1970s and 1980s. We were also part of the rebuilding and reconstruction of Sudanese health services in the 1980s. In January 2018, we were part of an initiative to set up the Sudanese Associations and Trade Unions in the UK (SATU). We set up a elected committee which has representatives from engineers, doctors, lawyers and journalists, former diplomats and other groups like the Graduates of Khartoum University. There are also writers groups involved. We were working ahead, working collectively to make sure that the Sudanese diaspora in the UK was organised. Since 1989 there have been several uprisings in the Sudan, but none managed to achieve change because of the violence by the government and arrests of leaders in the communities. One of the worst examples was in 2013 when 200 people were killed. Arrests continued for months and people were held without any investigation taking place. The trigger for the current uprising was the release of the budget in January 2018. People called it the ‘Hunger Budget’. At the time there were protests in the streets, and some of the leaders were arrested. The government made promises to improve, but nothing changed, in fact things got worse. By the end of last year people could not get any currency, they were not getting paid their salaries. If you wanted money from the cash machine you had to queue for hours from 5am. Then the price of bread started rising. There were no medicines, and no fuel. This is not just protests over bread and fuel, it is a revolution. There is unity between all different sectors of society. Women and girls at are the frontline. Young and old people are involved alongside the political leaders. The Sudan Professionals Association is a new addition. It was announced in 2018. However the work to build it up has been ongoing for a few years. The SPA organises journalists, lawyers, doctors and teachers. People are organising themselves and applying to join. What did the SPA do? The SPA united the professionals, they started to talk about the minimum wage, requesting an improvement. Then their demands changed – calling on the government to step down. This was in response to people going onto the streets – so people trusted it. The SPA represents the kind of people who are in every household. It has continuous support from ordinary people. There have been other groups who are part of the SPA but also working independently. The University of Khartoum lecturers had a press conference providing a detailed plan for the transition period. As lecturers and academics they have pledged to help with the rebuilding of services. There are 530 lecturers and professors who have signed up to the pledge. They had a protest inside the University on 30 January outside the library. This lifted people’s spirits and it shows there is true commitment to rebuilding. The demonstrations and protests are part of our peaceful resistance: they have given people hope and confidence, so that they feel we are not weak. Then there came the Declaration of Freedom and Change, announced on 1 January 2019, Sudanese Independence Day. The Declaration has three objectives. It is the pathway between the peaceful stepping down of the current regime, towards a four year transition period, rebuilding the country and democratic elections. The major forces in Sudan, including more than 20 political parties and youth groups have signed. This is very important because people think that there is no vision, that is not true. This is the first step – there is agreement about the pathway. There is also an open letter signed by 1500 Sudanese outside the country, expressing a commitment to take part in rebuilding and reconstruction. This not just a random group of 1500 people, but representatives of different sectors and professions. The only part missing is the army and the police. Middle and junior ranks are getting fed up, they are suffering financially too. But senior levels are loyal to the regime. We have the army, the police, national intelligence and security and the government militia. We are trying to send messages to the army and police calling on them to protect the people and not al-Bashir. We see little signs of hope, such as soldiers coming down from their trucks to take food from the women who bring provisions to the protests and thanking them. We have seen a lot of our leaders detained. We don’t know when they will be released. Two or three active leaders were arrested from their houses a few days ago. Some of these leaders have had to go underground. The government is using this in a negative way – but the leaders cannot come out openly or they will be arrested. The pressure from the international community for leaders of the uprising to come out openly is also having a negative effect on the movement. On Thursday 31 January there were hundreds of protests in different parts of the country, although people face excessive violence when they try to gather. We have had a dozen injured by live bullets, tear gas and injuries from beatings. What is the next step? People have started sit-ins in parks and fields, changing the tactics a bit. There have been lots of leaflets distributed in different neighbourhoods. This is not a centralised movement, all different parts of the country have been participating, and unlike previous uprisings, it is not concentrated only in the big cities. For me as a Sudanese woman, it is interesting to see how wide the support for this movement goes among Sudanese women. We have seen Facebook groups which were previously just for discussions about beauty and cooking showing their support for the protests. They have even been using the Facebook groups to identify police officers involved in beating protesters and warning people to stay away from them. Young women from these groups put out a statement on 31 January. This shows that all sections of the community are standing together. At the sit-ins people have been playing music and reading poems. ‘Silmiyya’ (peaceful) is a slogan of the protests. We are proud that we are using peaceful tools and trying to maintain a peaceful movement, even though 50 people have been killed. One of our colleagues, Dr Babiker Abdel Hameed was shot by the police: he was targeted because he was a healthworker. There are also ongoing strikes. Doctors have been on strike since the end of December, refusing to treat non-urgent cases. After Dr Babiker Abdel Hameed was shot civilian doctors also walked out of the police, security and army hospitals. Teachers have been on strike for a week, lawyers for a day, journalists for three days. Pharmacists have gone on strike several times. Representatives from Sudanese organisations in the UK met with the British government recently as British citizens. We told them that this is not just demonstrations about bread and fuel, it is a revolution. The Sudanese government has lost its mandate. We said we need a democratic government and sustainable development. We don’t want to stop funding for development, but the government is corrupt and so funding should go to rebuilding Sudan. We talked about violations, shoot-to-kill and the detainees and the British government’s role in training Sudanese police and security forces. If al-Bashir and his government continue in power this is a risk to security in the region. He doesn’t have money and he is in a disastrous situation. This means he could go back to supporting terrorism in order to secure more funding. 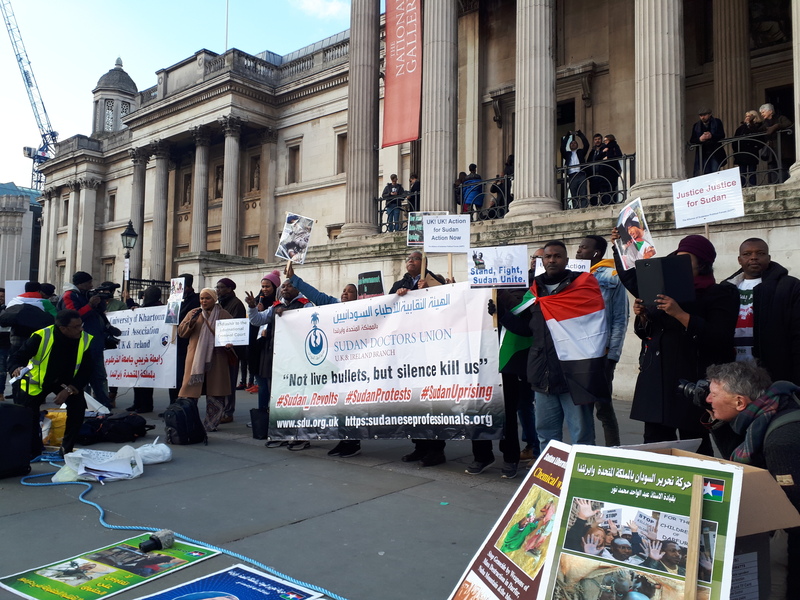 Read more on the uprising in Sudan in the Spring 2019 issue of Middle East Solidarity magazine – out later this month.